It’s been over a year since I planned and designed Meghan and Iain’s fall wedding. FINALLY, I get to show it off as it’s been featured on Mariage Quebec‘s website as well as in their Spring/Summer 2017 magazine on sale now! 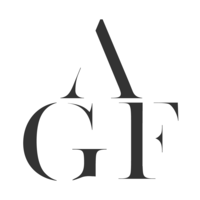 What an awesome year for AGF! Hello! I’m sharing another beautiful spring wedding today. I feel these are needed with the upcoming cold months. 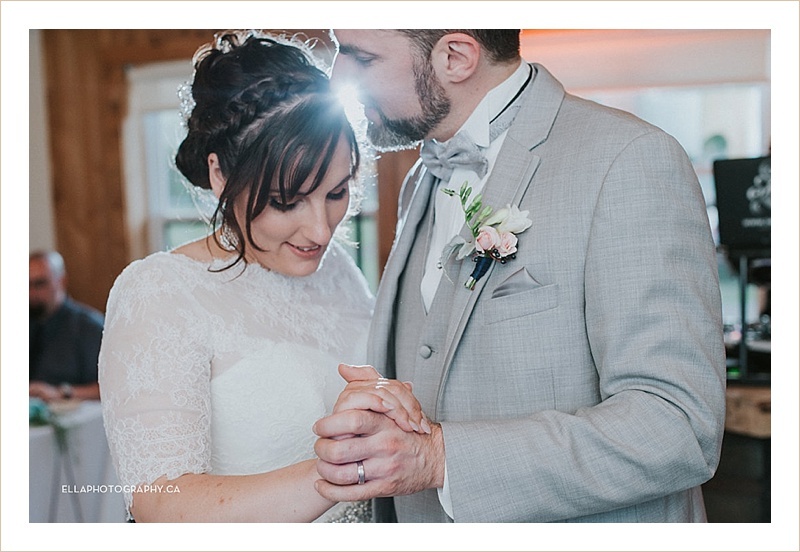 This wedding took place at a beautiful winery and orchard called Coteau Rougemont, just a tad outside of Montreal. This venue is absolutely adorable if you are looking for a nice intimate spot. I would say that the maximum number of guests you can fit (all depending on your seating arrangement) is 100. And I think that’s pushing it. The ceremony takes place overlooking the orchard and if you get married just at the right time like Danielle and Martin (May 21, 2016), it will be in full bloom. 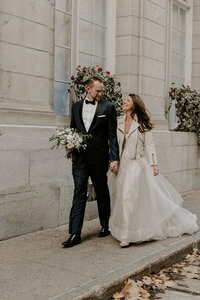 One of the great things about this venue is, they owners have a beautiful stone house right across the road from the site and offer it up as a rental to the bride and groom. The ceremony details were absolutely breathtaking. There wasn’t much, however, what was there spoke for itself. Danielle’s father built a wedding arch especially for his daughter on her wedding day. This goes back to my last blog post about including your parents in your wedding planning process here. It was such a fabulous addition to the crazy view. Geneviève from O.xide Design worked her magic with the floral garland that wrapped the arch. As usual, Geneviève’s bouquets were a sign for sore eyes. The blush, peach, and whites in contrast to the dark berries was absolutely romantic. Oh and the wedding party! They were a ton of fun! Every one of them was constantly laughing and joking. It could have been just the seven of them and it still would have been a party. The room was elegantly decorated. Simple and classy with white tablecloths and just a touch of colour coming from the florals and stationary. The next set of pictures will completely explain what I meant by breathtaking views. Ok, maybe the fact that they are so darn adorable together helps a bit. And well this one to top it off. One word… Love. All the best to Danielle and Martin! Looking for creative, fool-proof ways to pose your couples? Look no further! Sign up below to receive my expertly-designed Posing Guide for Photographers. A Gorgeous fête IS A montreal based event planning and design company.